Rita Moreno has won all four of the most prestigious awards in show business: the Oscar, the Tony, two Emmys, and a Grammy. Her countless credits span more than six decades, beginning with her Broadway debut at age 13. Moreno has starred on Broadway; London’s West End; appeared in more than 40 feature films, and countless television shows; has performed in numerous regional theaters including her one woman show, Life Without Makeup at the Berkeley Rep. She recently completed a 30+ city concert and lecture tour around the country. Rita stars in the Latino remake of Norman Lear’s classic sitcom, One Day at a Time on Netflix and also lends her voice to the character “Abuelita” on NBC-TV’s Sprout Network hit animated series, Nina’s World. Moreno has received the Kennedy Center Honor for her lifetime contributions to American Culture and was honored as the 50threcipient of the Screen Actors Guild Life Achievement Award. In 2015, she served as the Grand Marshall of the National Puerto Rican Day Parade. That same year she released her ‘first ever’ all Spanish language album, Una Vez Más, produced by good friend, Emilio Estefan. 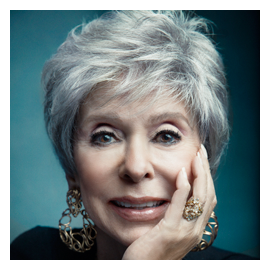 She also added New York Times Bestselling Author to her list of accomplishments with her first book, Rita Moreno: A Memoir published by Celebra Books. Rita was awarded the Presidential Medal of Freedom by President George W. Bush and National Medal of Arts by President Barack Obama.